Luang Prabang is probably the best known town in Laos for travellers to visit, especially with the beautiful Kuang Si waterfalls nearby, so it made sense that we would spend a few days here. However, our 2 day/3 night stay was extended to an extra night (and two full days), due to a rainstorm causing landslides and flooding on the road to our next destination. This gave us plenty of time to see more of Luang Prabang, but meant that we would have to skip Vang Vieng and fly straight to Vientiane, since the roads could take days to clear. 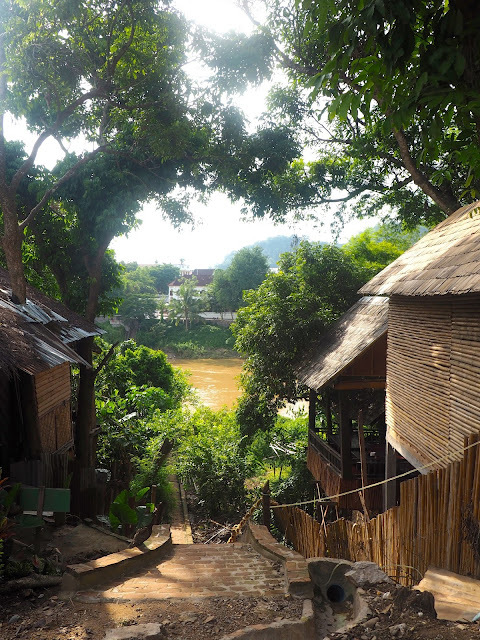 I didn't really need all that extra time in Luang Prabang, but it's a nice enough town for sure. It's a good size for walking and cycling around, and there are lots of nice bars and markets and such to explore, as well as dozens of temples, with many monks walking around town, and the museum to visit. The Mekong river may not be the nicest shade of brown, seeing as it picks up silt for hundreds of kilometres along its length, but it's still nice to sit down by the river, and Luang Prabang sit son a sort of peninsula, where the Nam Khan river meets the Mekong. We arrived here in the evening, after our two day boat trip down the Mekong, and had a pretty chilled out first evening, just going for dinner together. We walked through the night market to get there, but it was closing by the time we'd eaten - it closes at 10pm, and our tour leader warned us that Laos is very laid back about preparing meals, so food can take a while and all come at different times. We got a glimpse at the goods for sale though, with lots of brightly patterned clothes, scarfs and notebooks, and various other things available, so I was planning to go back another night. Laos also has a curfew of midnight, so all the bars start to close from 11.30pm, and we have to be back at the hotel by 12 every night, so there wouldn't be any late nights and crazy partying on this part of the trip. The next morning we had an orientation walk of the town, led by our local guide. We walked past a local fresh market, which was pretty small, really just a half dozen stalls, and what was the old hospital, but has since been converted into a hotel. We walked down to a slightly larger market, which was similar to many I saw in Vietnam, but it was pretty interesting to see some of the stuff for sale; there was raw meat being chopped up on the table, piles of fresh fish, and chickens being plucked right in front of us, as well as a selection of fruits, vegetables and herbs, and even some pink eggs, which are coloured that way because they've been charcoaled, to cover the black. We went down to the riverside and walked along for a while, stopping at a shop with snake whisky; literally, large jars of whisky with snakes distilling into it. Only a couple from our group were brave enough to try it! We saw a local silversmith's, with several craftsmen sat outside making goods, with some beautiful intricate designs being carved onto them. Our final stop was one of the temples, where our guide told us a bit about the lives of the Buddhist monks, since there are so many of them in Luang Prabang. Many are novices too, young boys who live and learn at the temples during their school holidays, before returning to being regular people for the rest of the year. The rest of the day was ours to do with as we pleased, so a few of us decided to rent bikes from the hotel (I'm not general much of a cyclist, but it was a small enough town that I could manage if I just followed the others) and went exploring. We rode all the way to the other end of the peninsula, and then started back up alongside the river. There are far too many temples in the town to visit them all, but we stopped off at one of the more famous ones, Wat Xiengthong. The central building was quite impressive, with the walls covered in dark patterns, and a huge gong to one side. Another building houses a sort of huge float with dragon-type heads at the front, a design found outside many of the temples around the town. We stopped at a cafe by the river for some snacks, and while "Mekong brown" is not the nicest of shades, it's still a pretty impressive river, with its massive size and volume of water, which moves much faster than you might realise, and we could see some of the village houses on the other side too. Getting back on the bikes, we ventured a bit further afield, crossing the Nam Khan river on a narrow rickety bridge. We had been told about a village on that side, but as we didn't really know where we were going, we just cycled around the streets for a while, and eventually stumbled upon another restaurant hidden amongst the trees by the riverside. It sounds like we made a lot of cafe/drink stops, but it was a very nice way to spend an afternoon, and see a lot of the town. There was a little jewellery shop next door to that I bought some souvenir jewellery from (a common purchase of mine when travelling, aside from my magnets, since it's small and light, and I know I'll use it). Later that evening we biked to dinner too - I stuck close to the others for riding in the dark! - which was at a popular place called Utopia, down by the river. We sat at low tables, many of us on cushions, on a platform overlooking the river, lit only by candles on the table. The food was good, the drinks better, and we stayed there for most of the night, as it got busier later on with crowds of people coming for drinks later on. They even had a beach volleyball court, which several members of our group took part in while the rest of us watched. Our plan for the next day was a visit to the Kuang Si waterfall, famous for its crystal blue water, and which you can swim in on good days. We'd put off our visit until our second day though, as there had been rainstorms in the area, and we'd been informed that the water was brown, so we were hoping it would be nicer by our second day. Unfortunately, more rain and thunder hit that night, and it was a miserable day when we woke up. The majority of the group opted not to bother, since it would be muddy and brown, and we certainly couldn't swim, but a few of us decided to check it out anyway. We were armed with raincoats and ponchos, but wound up soaked to the skin anyway, in the hour or so we spent there. At the base of the falls, as you enter, is a sun bear sanctuary, but we only saw one bear, since they were all hiding inside from the rain. 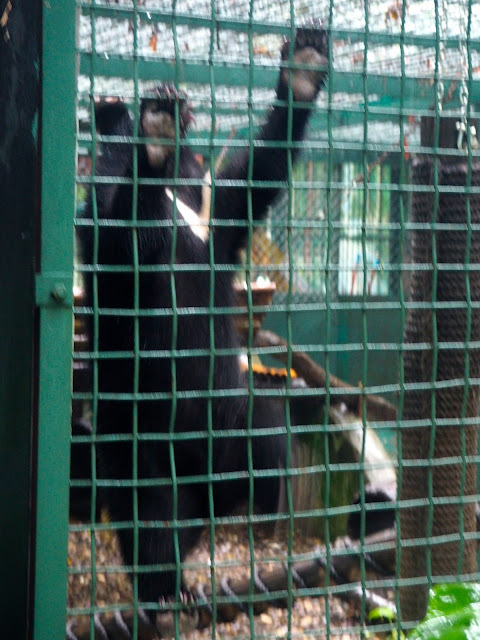 One is better than none though, and it was an adorable little cub running around the enclosure and climbing up the fences. The road up to the falls was partially blocked by a tree that had fallen down not long before we arrived, but we were still able to climb around it, though we got a bit muddy in the process. The falls themselves were brown yes, and impossible to swim in, but were actually amazing to see with that volume of water pouring down them. We crossed the bridge in front of them, and felt like we might have been swept away by the wind and rain pounding against us. We walked back downstream a bit, past areas that would normally be for swimming and sitting and eating, but were instead slippery and flooded, and the water was rushing down in swirling rapids. It wasn't at all what I had in mind when planning to visit the falls, but it was a lot of fun nonetheless. That afternoon, after a hot shower and change of clothes, we took a wander through town and had a late lunch. It wasn't exactly local fare, as we had burgers at an Aussie bar, but they were damn good burgers, and sometimes I need a break from Asian food. I spent the rest of the afternoon and evening hopping between a few bars with various people, playing games and ordering snacks along the way. I ducked out for a little while to visit the night market (since at this point, we thought this was our last night in Luang Prabang), where I haggled some more pieces of jewellery and my Laos magnet, featuring a picture of the Kuang Si falls on a much sunnier day. A few more drinks and tapas, and then it was time for bed. The third morning, we got ourselves up at 5.30am to see a local custom in the town streets. Since the monks dedicate their lives to their learning and studies, they do not earn money, so they are supported by the local people. They leave their temples at sunrise every morning, and walk the streets with baskets, and the local people donate food to them, which they will eat for breakfast and lunch (they don't have dinner). People also visit the temples at other times of day to make donations, but this morning ritual happens everyday. We went along just to watch - there are locals selling sticky rice to tourists to donate, but I read that this isn't a good idea, as they will end up selling more to tourists than donating it to the monks - and take a few photos, before going back to bed for another hour. This was also the day we were due to leave Luang Prabang, to drive to Vang Vieng, but our tour leader informed us that the only road there was entirely flooded, so our bus couldn't reach us, and nor could we get across to him. We initially were told we'd be staying the morning, and get an update around 1pm, so the logical thing to do to was play beer pong. Well perhaps not, but that's what we decided to do. We didn't have any real plans, since we didn't know we were staying, so we decided to just take it easy and hang around the hotel lobby, playing ping pong, which escalated into beer pong - although when Jeanne and I played, the boys drank for us, since it was 10am. The update was that we would have to stay a fourth night in Luang Prabang, and fly to Vientiane the following evening. We ventured out in the afternoon again, going for another late lunch and some drinks. It was a very lazy day really, in part from the waiting around, and in part because we were just being a bit lazy and having a relaxed day. We also seemed to eat more Western food during these couple of days - having dinner at the same Aussie bar again - which makes for a nice break, but between that and having to skip a whole town, meaning we only went to two towns in Laos, I did start to feel like I wasn't experiencing enough of Laos's culture. We tried to make up for this by being a bit cultural again on the last day, and climbing the hill in the centre of town, known as Phu Si Mountain (sometimes spelled Phou). It was a pretty hot day, so the climb up the narrow stone stairs was not the most pleasant (sweaty, to say the least! ), but it did make for a wonderful view at the top. There is a stupa up there, bright and gold, which you can see from other parts of the city, but the temple itself is very small. There are several statues on the path up too, of golden Buddhas, of various sizes and in various positions, which were quite fun to come across amidst all the greenery around us. The view from the top was the highlight though, as we could see all over the town, and across both the surrounding rivers. The descent was considerably easier than the ascent, of course, and we took a different route down, so we finished up outside the Royal Palace, which is now the museum. We didn't go in, since some of the group had already been, but it is a pretty impressive building from the outside, which is saying something in a town with so many temples. We stopped off for lunch, before heading back to the hotel to relax for a few more hours - which yes, did involve more beer pong, and a game of ring of fire. We finally left Luang Prabang that evening, catching a flight to Vientiane, which lasted no time at all really. Luang Prabang was a nice town, and definitely one to visit if you're in Laos, but four days was much longer there than I needed, and it was a shame to be missing Vang Vieng. It's a nice sized place though, with various things to see, but still feels small and not too busy (a bit similar to how I likened Chiang Mai to Bangkok). The waterfalls were a highlight of course, though I would have preferred to see them clear and blue, and been able to swim in them, but I long ago accepted that things can't always be perfect when travelling, which also applied to our unfortunate detour. If I ever go back to Laos, I'll try to see the falls in the dry season, and visit Vang Vieng too, but there's no immediate plans for that any time soon. It was a good few days though, and nice to just relax and chat with everyone; now, one last stop for a few days in the country's capital.